According to a new notification by FBR, the deadline for Income Tax Returns has been extended by a span of 15 days. Thus, the last date to submit all income tax returns is now 30th November 2016. The new deadline applies on final tax regime, business individuals, association of persons, salaried individuals, and companies falling under special tax year. Originally the last date was August 31st. 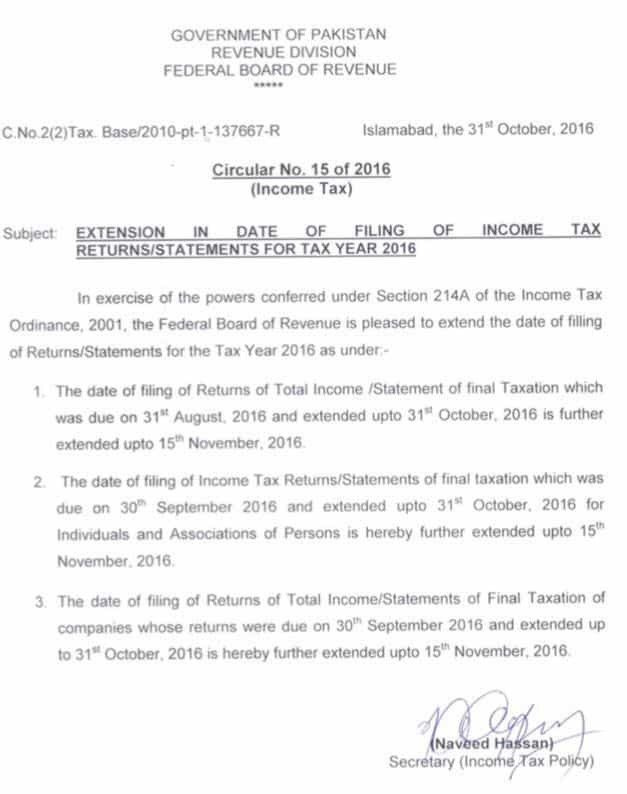 This was moved to September 30th and recently to October 31st, however because tax payers did not comply with the given dates, it has now been extended, which is now a usual practice y FBR. You’ll have to get your Registration Number and password first via FBR’s e-Enrollment process. To do that, click here to get to the main page of Iris, FBR’s simplified ERP system for tax payer registration. You’ll need to go to ‘Registration for Unregistered Person’ if you’re a first time user. Provide the information required.You’ll be sent a confirmation input to validate your account (usually an email and/or SMS). You’ll be sent password/PIN to login with your account. Sometimes this process might take a few days for security reasons. 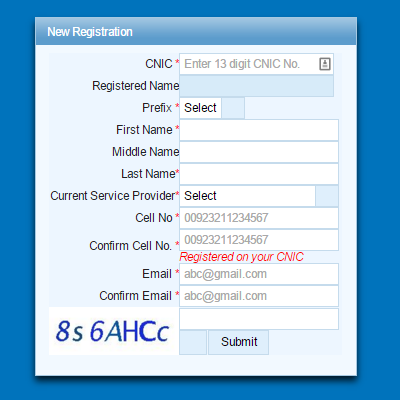 Once you’re registered successfully and have logged in by entering your Registration No. and password on the main page of Iris, you can now file your wealth statement. For salaried persons, you will have to fill wealth statement and income tax returns. 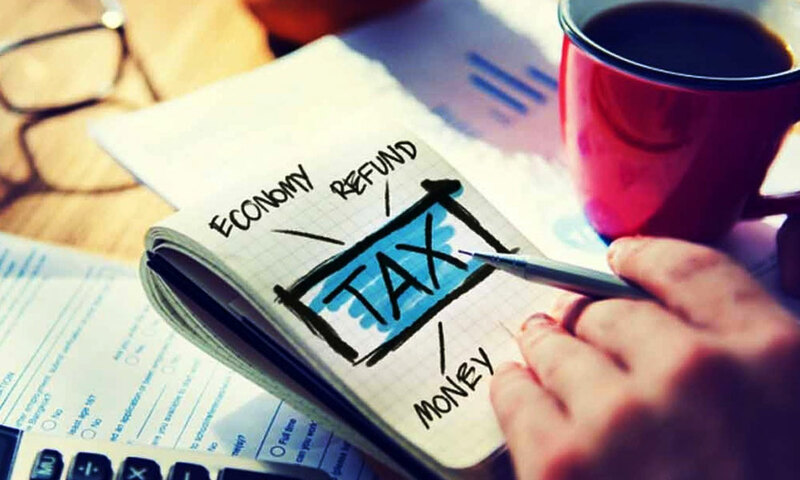 The procedure for filling out your details for wealth statement income tax returns are present here. More detailed help can be found here, concerning FAQs, Registration, Income Tax Returns and more. In case of AOPs/Companies – the 7-digits NTN (excluding dash and check digit). 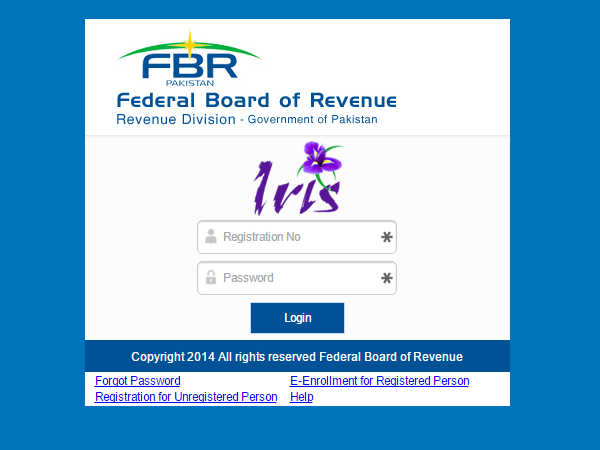 Visit the link e.fbr.gov.pk and select the tab E-registration. Then in the next column, mention your employers NTN and city of your employment if you are an employee. If a businessman, fill in the details of your business as well. Your application is complete. Click on ‘Print’ to get a print of the application and sign it. It will alert you if there is an existing NTN from your previous job. If you still have doubts, use your CNIC number to get it. You will be allotted an NTN after 2 working days via an email. Meanwhile, enclose a paid electricity bill, salary certificate and copy of CNIC with the printed application and take it to your concerned RTO office. You will be issued the NTN certificate.